Words by Jess Whinfield. As seen in Horse's and People magazine July 2017. Image: Simon Bailey is a Professor of Pre-clinical Veterinary Sciences at the Melbourne Veterinary School, University of Melbourne. Dr Simon Bailey is a world-leading researcher who has devoted his professional career to examining endocrinopathic laminitis, a common, but potentially devastating, disease. With over 30 horses on his property, including one pony that ís being managed for laminitis, Simon is well-versed in the challenges the disease presents from the perspective of a horse owner, a researcher and a veterinarian. In this article, he shares his research findings on the topic, as well as the key steps that can be taken to prevent the disease. Simon's interest in laminitis began in his final year of veterinary studies in 1993 and he went on to publish a PhD on the subject. Now, almost 20 years later, Simon is a Professor at the University of Melbourne Veterinary School, and he and his team continue to answer questions around the relationship between diet, management practices and endocrinopathic laminitis. Endocrinopathic laminitis is the form of laminitis that makes Spring time such a stressful season for pony owners. As well as rich pasture, it can also develop in animals on high sugar or high starch dietary supplements. Image: The devastating effect of the detachment of the lamina from the hoof wall is the rotation of the pedal bone. 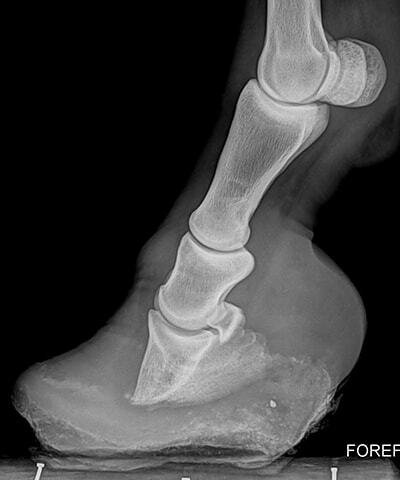 Although it can have the same catastrophic outcomes as inflammatory laminitis, which can be triggered by carbohydrate overload (commonly seen when horses get into feed bins) or systemic diseases (such as colic or retained placenta after foaling), endocrinopathic laminitis is distinct in the way it causes disease in the hoof. Endocrinopathic laminitis is a condition that does exactly what it says on the tin - if you're fluent in Latin. The prefix 'endocrin' refers to the endocrine glands, which are the producers of hormones. 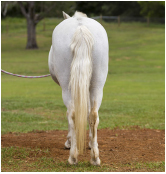 In relation to laminitis, insulin is the hormone of interest. The suffix '-pathic' simply means 'disease'. The term 'laminitis' can be similarly broken down, with the '-itis' component meaning 'inflammation' and 'lamin-' referring to the laminae in the hoof. So, a rather wordy translation of 'endocrinopathic laminitis' is: 'a disease caused by hormones which results in inflammation or breakdown of the hoof laminae'. Before the relationship between insulin and laminitis can be understood, it's important to understand the normal role of insulin, which is the same in horses and people. Insulin is a hormone produced by the pancreas and is essential for life. It's released into the blood when the body detects that blood glucose levels (sometimes referred to as blood sugar levels) are increased, such as after a sugar or starch-rich meal or on lush pasture. Insulin triggers the movement of this glucose out of the blood stream and into cells, where it can be used as a source of energy. It also promotes obesity. In overweight animals, insulin continues to be produced, but the body's cells ignore its presence. This means the glucose stays in the blood, rather than being taken up into cells. The body detects these persistently high blood glucose levels, and so produces yet more insulin to try and lower them. A cycle, therefore, develops in which there are large amounts of insulin in the blood, but the cells are unresponsive to it, and so, blood glucose remains high, triggering yet more insulin release. This is the same mechanism that results in metabolic syndrome, or 'pre-diabetes' in humans. Interestingly, horses with high insulin levels very rarely develop diabetes. Rather, they become laminitic. These elevated insulin levels are one component in a group of related conditions, termed Equine Metabolic Syndrome (EMS). Obesity is another common outcome of EMS. EMS is the horse equivalent of metabolic syndrome seen in humans, although the outcomes are quite different. Elevated insulin levels are problematic because insulin does more in horses than lower blood glucose levels; it also causes the cells of the hoof laminae to proliferate and weaken. This causes the sensitive laminae to stretch. In the healthy hoof, the laminae are crucial for attaching the hard, external hoof capsule to the soft tissue and bone of the foot. With the laminae now stretched out of their normal proportions, due to elevated insulin, they no longer lock neatly into the grooves of the hoof capsule. As a result, painful detachment of the hoof wall from the underlying structures occurs. This is reflected in the classic clinical signs of laminitis; foot pain and a reluctance to move. Why are ponies and some horse breeds so susceptible to laminitis? Largely, it's a consequence of evolution. Many ponies, as well as horse breeds from Spanish lineages, such as Andalusians, have evolved over millennia to survive on scant grass availability in the harsh environments of the North West of Britain and the deserts of Spain. But, today, horses and ponies that are exquisitely adapted to subsist on meagre rations are kept on rich pastures developed for sheep and cattle - modern breeds of which have been developed to require more bountiful environmental conditions. the ponies have evolved to maximise every bit of sugar available to them, and so, they readily become obese and develop chronically elevated insulin levels. This is the same scenario as confronts indigenous human populations world-wide. After thriving on hunter-gatherer diets for hundreds of thousands of years, when communities are confronted with the high-fat, high-sugar foods of the modern Western diet, catastrophic levels of type two diabetes and metabolic syndrome are seen. The Body Conditioning Scoring (BCS) scale was developed in the 1980’s by Don Henneke, PhD, to evaluate the condition of broodmares. The scale goes from 1 to 9 - where 1 is emaciated and 9 is extremely fat or obese. 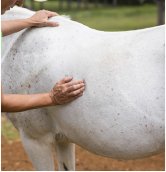 The BCS system is based on visual appraisal and palpable fat cover at six areas of the horse’s body. 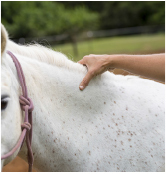 In this photo series, we assess the Body Condition Score of Mary, a pony mare approximately 12hh and 12 years old. Photos by Linda Zupanc. First, assess the whole body from the side to get a general impression. Assess the whole body from behind. Then, begin assessing and scoring the following six individual regions. Neck is smooth, score 5. Withers are rounded, score 5. Shoulder has some fat, score 6. Ribs are not visible, but can be felt, score 6. Loin is level, score 5. Tail head has soft fat, score 5. Mary’s overall score is 5 (moderate), which is considered the ideal for a pony of this type and her level of activity. 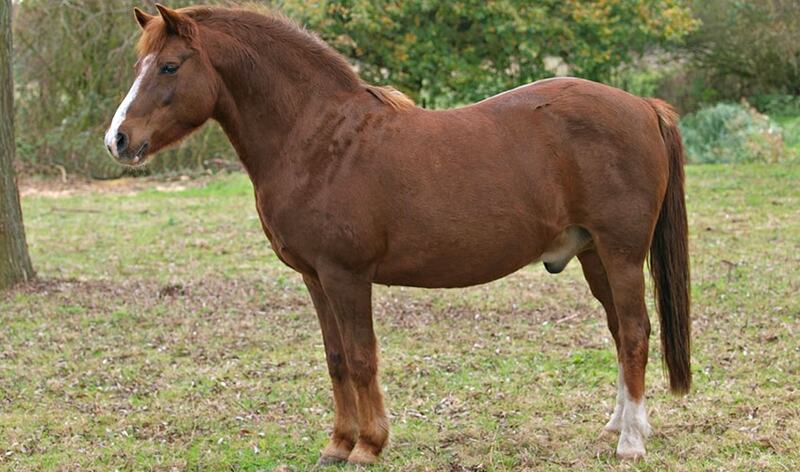 Compare Mary with the chesnut pony above which is in obese condition with a cresty neck and may be at risk of laminitis. Image courtesy Simon Bailey. From a practical perspective, prevention is the most important part of any discussion on endocrinopathic laminitis. And the good news is, in many cases, this form of laminitis is preventable. The most crucial part of laminitis prevention is maintaining a healthy body weight and avoiding obesity. Whilst obesity doesn't cause laminitis, it is commonly correlated with high levels of insulin - which does cause laminitis. Thus, the body condition of a horse can be used as a visible and measurable stand-in for insulin levels, which are effectively invisible without laboratory tests. 1. 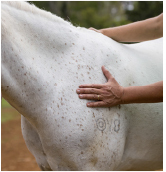 Assess your horse's body condition, and assign a body condition score. There are two major methods by which this can be achieved. The first involves assessing the amount of fat covering different areas of your horse, as explained in the images on the left. The second method has been relatively recently developed by Simon and a team of researchers, and is the equine equivalent of the Body Mass Index calculation commonly performed at human gyms. This second method is recommended for people new to body scoring because it's easier to perform accurately and, thus, produces more reliable results. Instructions on how to perform both methods and an interactive tool for doing so are available at the following website: https://www.spillers-feeds.com/weight-management-tools/. Both condition scoring methods produce a score between 1 and 9, based on a system called the modified 9-point Henneke Scale. A score between 4.5 and 5.5 is ideal. A horse that scores between 6 and 6.5 is over-conditioned, and a score between 7 and 9 indicates obesity. 2. If your horse has a body condition score between 6 and 9, you should remove sugar- and starch-rich supplementary feeds from their diet. This includes feed stuffs such as corn, barley and wheat. If it is on lush grass, it may be necessary to restrict access to pasture. A horse doing mild to moderate exercise (equal to, or less than, 20 minutes of exercise, three times per week) does not normally require high sugar supplementary feeds. Removing these foods and restricting access to pasture (providing moderate quality hay instead, plus a protein/ vitamin/mineral balancer), is the equivalent of placing the horse on a low- GI diet. 3. If your horse remains in a condition score above 6 following the removal of sugar- and starch-rich rations from their diet, call your veterinarian. Your veterinarian will be able to advise management strategies and dietary modifications to assist in weight loss and laminitis prevention. They are also able to assess your horse or ponyís insulin levels, and evaluate their chances of developing endocrinopathic laminitis. Some horses and ponies are more vulnerable than others and, considering the amount of effort managing an at-risk horse can be for the owner, this is useful information to know. Management of at-risk horses and ponies is incredibly complicated and requires a holistic approach. It can be challenging to balance the welfare needs of the pony, such as providing adequate enrichment and companionship, with laminitis prevention. Even changing the diet too drastically, or too little, can have damaging consequences as a result. With so many factors that must be considered in developing a management plan, it is ill-advised to attempt such measures without seeking professional veterinary advice first. 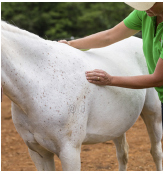 Even if you believe your horse or pony isn't overweight, it's worth performing a body condition score - it's quick and easy, and costs nothing to perform. 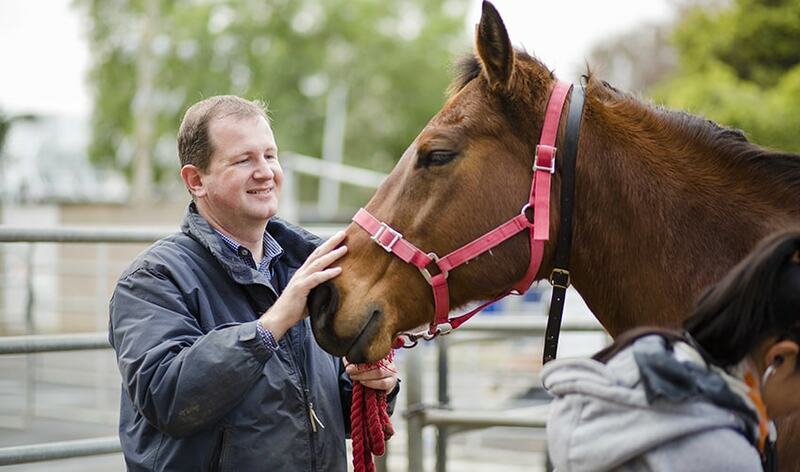 A component of Simon's research has been surveying participants of Pony Clubs across Victoria. 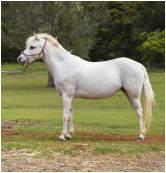 Three in 10 ponies were found to be obese, and this probably reflects the situation for many pleasure horses and ponies across the South and East of Australia. 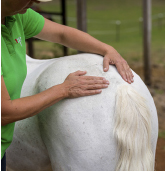 It was also notable that 40% of riders surveyed underestimated their horse's body condition score. Simon emphasises that taking simple steps, such as making yourself aware of your horse's body condition, can go a long way to reducing their risk of laminitis - and this simple skill is underdeveloped in many owners. Obesity has become so prevalent in ponies that overweight has come to be perceived as normal weight. Another key consideration when it comes to avoiding the severe, long-term consequences of laminitis is early recognition. Simon implores horse owners to get their veterinarian involved as soon as they notice their horse is exhibiting a stiff gait or reluctance to move. Even a horse that isn't lame on pasture may be lame on hard surfaces, such as concrete, and this is the time to get your veterinarian out. They will be able to confirm a diagnosis of laminitis, dispense pain relief, provide frog support and suggest future management options. Early laminitis diagnosis can reduce the duration of disease from several, severe months to a handful of mild days. It makes for a happier horse and a happier owner. If you are in doubt, explains Simon, call your veterinarian. It's important to remember stress can exacerbate the risk of laminitis. When an animal is stressed, their body releases a hormone called cortisol which, in turn, increases the levels of insulin in the blood. This is one of the reasons it's essential no dramatic changes to a pony's diet or lifestyle are made without veterinary advice. Rather than benefiting the animal, it often does more harm than good. Simon's firm advice is to 'never starve the pony' by giving less than 1-1.25% of their body weight in dry matter of hay per day. Whilst stress can play a role in increasing the risk of laminitis, the surface a horse is kept on has little influence. Normal principles apply: horses should be kept on well-draining surfaces and extremely firm surfaces, such as concrete, should be avoided. But, other than that, the surface shouldn't influence a horse's risk of developing laminitis unless it is often exercised on a hard surface. When treating a case of laminitis, however, a sand or deep bedded surface will take some weight off the hoof wall and make the horse more comfortable. Regular routine hoof care performed by a farrier or trimmer can help in the early detection of changes that indicate a horse or pony is on the cusp of laminitis. This is a good time to get your veterinarian involved. Whilst exercise is essential for the overall health and wellbeing of all horses and ponies, Simon's research has shown that dietary management has a greater impact than exercise on reducing a horse's risk of laminitis. One of Simon's experiments involved feeding two groups of obese, at-risk horses and ponies the same calorie restricted ration to encourage weight loss, but exercising only one group. Both groups normalised their insulin levels, but the group that exercised daily did not have any further benefits in terms of the metabolic risks of developing laminitis as the group that didn't exercise. Furthermore, just as in people, diet is more important than exercise when it comes to achieving weight loss results. So, whilst exercise is important as part of a holistic management strategy, exercise alone is not directly associated with reducing their risk of laminitis. In recent years, huge advances have been made in terms of our understanding of endocrinopathic laminitis. Simon and his team are continuing to unravel the connection between nutrition, dietary management, insulin and pasture-associated laminitis, and it is likely that further advances will be made in the years to come. It is the responsibility of horse owners, nutritionists and veterinarians alike to stay abreast of suggested changes in management as they arise. After all, managing laminitis requires a team approach that involves the owner, veterinarian, farrier or trimmer and, sometimes, a qualified equine nutritionist to work towards the common goal of endocrinopathic laminitis prevention.